"Competing in today's recycling markets is tough," said Penn Waste Director of Recycling Operations Tim Horkay. "Our investment in this new technology is immediately paying off with both higher purity of our fiber and greater recovery of steel cans. The two technologies complement each other well." "Max-AI technology is remarkable in that it can detect multiple views of different material categories in one location using a camera and AI, similar to how a person can using his or her eyes and brain - the difference being Max can do this at very high speeds," said NRT President Matthias Erdmannsdoerfer. "While our SpydIR line of optical sorters is fantastic at identifying materials very confidently at high volumes, it is limited to material composition analysis. 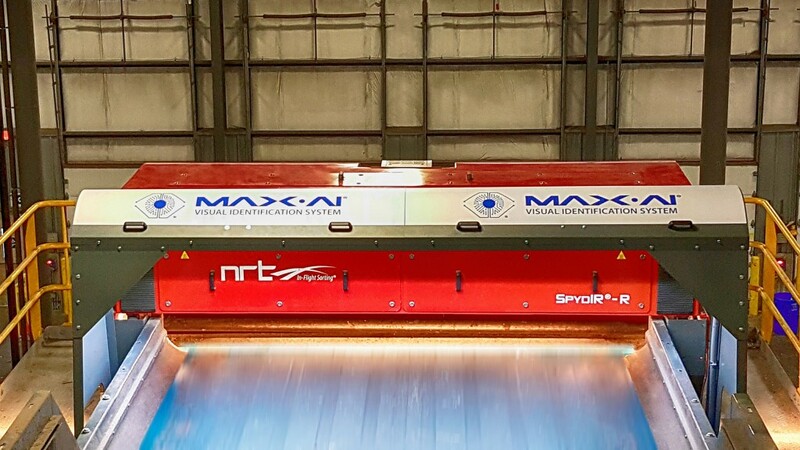 Recyclers care about more than material type, and this is where Max comes in. We can now sort using the SpydIR's speed and confidence while adding the criteria that Max is able to differentiate. "For example, in a PET sorting application, while the optical sorter identifies the material PET, Max is able to differentiate between different types of PET like thermoform tray, redemption container, food-grade, rigid, bottle and more," continued Erdmannsdoerfer. "Thus, the customer is able to produce a product with increased value at a minimal additional expense without the need to add labor. It is among the most impactful innovations in optical sorting in recent memory." Other examples of the capability of this combination of technology is shown in the chart below.